First Hotel Avalon is nestled in Gothenburg, Sweden within walking distance of the world-renowned 19th century park Garden Society of Gothenburg, the discriminating traveler will find the modern and inviting retreat created in the 21st century called the First Hotel Avalon. This unique 6-story modern structure that opened in 2007, offers 101 modern rooms with 24 providing an in-room mini spa. Book YOUR Hotel Room at First Hotel Avalon Here! 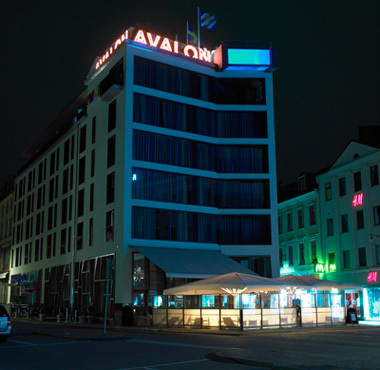 Picture of the Hotel Avalon’s Fasad. The wine list is ever changing at First Hotel Avalon in keeping with the hotel’s plan to always look to what is new and exciting. Eating in the comfortable settings of its dining room, one will enjoy a relaxed intimate gourmet experience. The bar at First Hotel Avalon Gothenburg is more like the experience one has in the kitchen of a really enjoyable house party. All are intended to provide the essential guest with an unforgettable visit because they know how to keep you coming back again and again. A stay at this fine hotel will leave with you plenty of wonderful experiences that you will want to share with friends and colleagues alike. 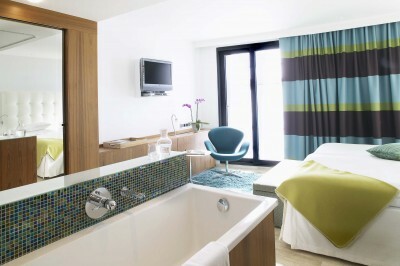 Picture of a superior room at the First Hotel Avalon Gothenburg. Take the short journey to explore the roof top terrace to enjoy a drink or take a dip in the pool that has a see-through bottom. While you are in town, you should also enjoy the setting sun and experience nature in the heart of Gothenburg. This hotel can provide for larger groups in the Party Suite where one can lounge in comfort on the pier outside. If you are looking for a classy location for your wedding, First Hotel Avalon is an excellent choice for you and your loved one. 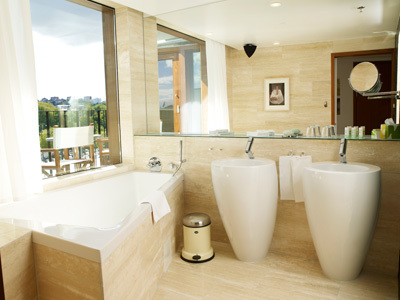 Picture of one of Hotel Avalon’s hotel room bathrooms. You definitely get a different experience than anywhere else at First Hotel Avalon Gothenburg, where they are all about providing accommodations that convey genuine hospitality and cultural authenticity. If you are looking for thought-provoking designs and groundbreaking architecture, there isn’t a better place to visit in the city of Gothenburg.